White LEDs ---- Full-spectrum / wide-Kelvin provide fill for all missing spectrums and add Lux. UV 380 - 400 nm ---- Process of chlorophyll absorption begins. UV (ultraviolet) has the unique function of sterilization and kills phytopathogenic bacteria. IR---- There is little absorption by Chlorophyll here, but Phytochrome uses a nice portion. Flowering and germination is influenced. 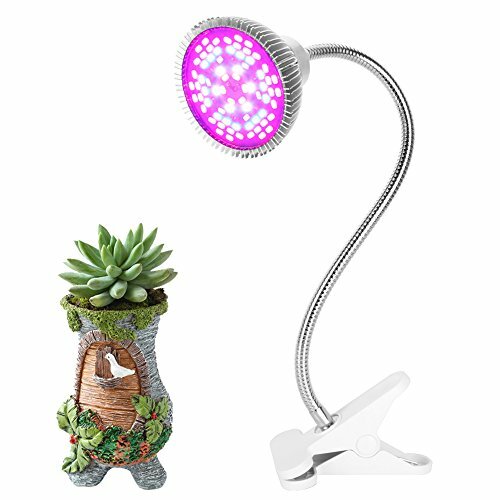 Upgraded Morsen led grow lamp with flexible 360 degree neck. Luminous:2500lm; height,15inch; power cord length: 50 inches, Off/On switch power cord. Long lifespan with Morsen guarantee: 30-day no-question-asked money back guarantee,12 months replacement warranty and lifetime customer support. If you have any questions about this product by MORSEN, contact us by completing and submitting the form below. If you are looking for a specif part number, please include it with your message.